In the initial list, written by Philo of Bystism in the 3rd century BC, there was not the lighthouse of Alexandria, which was not yet built, but in its place there were the Remparts of Babylon, which are more a part of it. Why were the ramparts of Babylon removed from the list? We do not know! it is not known when and why they were replaced by the Lighthouse of Alexandria. However, we know why this lighthouse came into the list, it is simply because it was built after the establishment of this list. This lighthouse so subdued people at the time that it was also considered one of the wonders. It should be noted that the lighthouse had a role of propaganda, it had to symbolize the power of Egypt and the fact that it is at the entrance of the main port of the country (if one can speak of country at that time) it was seen by most travelers in the world, so its popularity was rapid. The ramparts of Babylon, meanwhile, were gradually forgotten after the fall of the Babylonian Empire. Learn more about the ramparts of Babylon. Where are the 7 wonders of the world? They are all in Mediterranean Europe or Asia Minor. 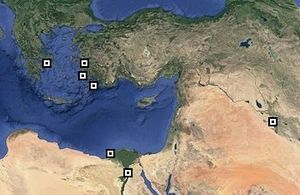 Currently 2 are in Egypt, 2 are in Greece, 2 in Turkey, 1 in Iraq. Of course, at the time they were in different civilizations, depending on the time when they were built. The pyramid of Kheops was built in ancient Egypt, while the lighthouse of Alexandria was built in ancient Egypt. The statue of Zeus was built in ancient Greece, as was the Mausoleum of Halicarnassus, in Caria, under Persian rule. It is unknown, but it is attributed to Philo of Byzantium, a Greek author of the third century BC, who quoted earlier authors. His list was based on several other lists which he would have compiled. This document is known because there is a copy kept at the University of Heidelberg in Germany. Lear more about: The document of Philon of Bysance. What is the document of Philo of Byzantium? It is a booklet of 7 pages written in Punic, a language lost today. He began with an introduction and then wrote a paragraph of about twenty lines for each wonder. Unfortunately the last page is lost, we do not have the description of the last monument inscribed, the Mausoleum of Halicarnassus. What are the 7 wonders of the modern world? Learn more about the seven moderns wonders. What role has UNESCO played in the choice? Absolutely none. UNESCO, which is responsible for inventorying and promoting and protecting World Heritage, has had absolutely no role whatsoever. The establishment of this new list was a private decision of a Swiss businessman, Bernard Weber, who set up a foundation, the "New Seven Wonders Foundation" to launch this great international competition. But neither the sites presented nor the final choice was made in agreement with UNESCO, which rather had to defend itself of any partisan interest in this project. How were the sites chosen? They were chosen democratically, since everyone on Earth could vote for one of the 21 sites chosen. But the system was misled because the sites actually selected were the ones that received the most votes, but some countries have multiplied the calls to vote with their population, which has not been done by others. In addition to the introduction of automatic systems or reimbursement of calls by the governments of the said countries. The result is a choice oriented, but which nevertheless corresponds to a reality, that of a list of monuments that all could claim to be on this list. Where is the hanging gardens of Babylon? It is a great mythical building that is supposed to be in the city of Babylon, in Mesopotamia, currently 100km south of Baghdad, Iraq. But the fact that this monument is the only one of the seven whose archaeological finds have not been found causes us to doubt their sites or even their existences. A recent thesis places the gardens in the city of Nineveh, formerly in Assyria. What did the hanging gardens of Babylon look like? As it is the most enigmatic of the seven wonders, it is difficult to make a precise description of it, especially since the rare testimonies of the time were lost. Nowadays we have only texts containing these testimonies, they have necessarily been modified. Still, the gardens seem to have been a succession of terraces raised by heavy pillars forming a vault. On these terraces were different species of plants, which gave the impression of a garden in the sky. But most of the drawings of this period are too rudimentary for reliance, and subsequent representations are merely artistic views, without any scientific notion. Here you have a full description:Description of the hanging gardens. Where was the temple of Artemis? The temple of Artemis was in the ancient city of Ephesus, a city that is now extinct near Selcuk, Turkey. It is nowadays an archeological site at 5Kms inland while it was at the time by the sea. It is the alluvial deposit of the local river that caused this shift of the littoral. What is the relationship between the temple of Artemis and Artemisia? It's just the same thing. We talk about one or the other without distinction. The materials used were marble and wood. The marble was innovative for the time: Heavy stone and difficult to cut, it was necessary that the manufacturers invent new methods of transport to transport the stones on the site of the site. The lifting methods were also innovative because it was impossible for the time to lift loads so heavy at a height of 20m. Learn more about the construction of Artemision. Where was the Colossus of Rhodes? It was on the port of the city of Rhodes, on the island of the same name. Contrary to the usual representations, this gigantic statue did not cross the entrance of the port, it would not have been possible. It is more likely that it was a little removed from the entrance of the port, clearly visible but not blocking the passage of maritime traffic. Learn more about location of the 7 wonders. The author of the statue was Chares de Lindos. Lindos was one of the 3 cities on the island of Rhodes. This sculptor of the 3rd century BC was master in the use of realistic style, his statue wanted as real as possible. He supervised the work and it was under his responsibility that it was built. Learn more about Charès of Lindos. Have a look at the list of the 7 wonders of the world: Discover the list.